Not to be confused with Acetylcholinesterase inhibitor. An angiotensin-converting-enzyme inhibitor (ACE inhibitor) is a pharmaceutical drug used primarily for the treatment of hypertension (elevated blood pressure) and congestive heart failure. This group of drugs cause relaxation of blood vessels, as well as a decreased blood volume, which leads to lower blood pressure and decreased oxygen demand from the heart. They inhibit the angiotensin-converting enzyme, an important component of the renin–angiotensin–aldosterone system. Frequently prescribed ACE inhibitors include zofenopril, perindopril, trandolapril, captopril, enalapril, lisinopril, and ramipril. In treating heart disease, ACE inhibitors are usually used with other medications. A typical treatment plan often includes an ACE inhibitor, a beta blocker, a long-acting nitrate, and a calcium channel blocker, in combinations that are adjusted to the individual patient's needs. There are fixed-dose combination drugs, such as ACE inhibitor and thiazide combinations. ACE inhibitors have also been used in chronic kidney failure and kidney involvement in systemic sclerosis (hardening of tissues, as scleroderma renal crisis). Furthermore, ACE inhibitors may also be used to help decrease excessive water consumption in schizophrenic patients with psychogenic polydipsia. A double-blind, placebo-controlled trial showed that when used for this purpose, enalapril lead to decreased consumption (determined by urine output and osmality) in 60% of patients; the same effect has been demonstrated in other ACE inhibitors. One mechanism for maintaining the blood pressure is the release of renin, an enzyme, from cells in the kidney (to be specific, the juxtaglomerular apparatus). This proteolytically cleaves and activates another circulating protein, angiotensin. This system is activated in response to a fall in blood pressure (hypotension) and markers of problems with the salt-water balance of the body, such as decreased sodium concentration in the distal tubules of the kidney, decreased blood volume, and stimulation of the kidney by the sympathetic nervous system. In such situations, the kidneys release renin, which acts as an enzyme and cuts off all but the first ten amino acid residues of angiotensinogen (a protein made in the liver, and which circulates in the blood). These ten residues are then known as angiotensin I. ACE then removes a further two residues, converting angiotensin I into angiotensin II. ACE is found in the pulmonary circulation and in the endothelium of many blood vessels. The system increases blood pressure by increasing the amount of salt and water the body retains, although angiotensin is also very good at causing the blood vessels to tighten (a potent vasoconstrictor). ACE inhibitors block the conversion of angiotensin I (AI) to angiotensin II (AII). They thereby lower arteriolar resistance and increase venous capacity; decrease cardiac output, cardiac index, stroke work, and volume; lower resistance in blood vessels in the kidneys; and lead to increased natriuresis (excretion of sodium in the urine). Renin increases in concentration in the blood as a result of negative feedback of conversion of AI to AII. AI increases for the same reason; AII and aldosterone decrease. Bradykinin increases because of less inactivation by ACE. Vasoconstriction (narrowing of blood vessels) and vascular smooth muscle hypertrophy (enlargement) induced by AII may lead to increased blood pressure and hypertension. Further, constriction of the efferent arterioles of the kidney leads to increased perfusion pressure in the glomeruli. It contributes to ventricular remodeling and ventricular hypertrophy of the heart through stimulation of the proto-oncogenes c-fos, c-jun, c-myc, transforming growth factor beta (TGF-B), through fibrogenesis and apoptosis (programmed cell death). Stimulation by AII of the adrenal cortex to release aldosterone, a hormone that acts on kidney tubules, causes sodium and chloride ions retention and potassium excretion. Sodium is a "water-holding" ion, so water is also retained, which leads to increased blood volume, hence an increase in blood pressure. Stimulation of the posterior pituitary to release vasopressin (antidiuretic hormone, ADH) also acts on the kidneys to increase water retention. If ADH production is excessive in heart failure, Na+ level in the plasma may fall (hyponatremia), and this is a sign of increased risk of death in heart failure patients. With ACE inhibitor use, the production of AII is decreased, leading to decreased blood pressure. Epidemiological and clinical studies have shown ACE inhibitors reduce the progress of diabetic nephropathy independently from their blood pressure-lowering effect. This action of ACE inhibitors is used in the prevention of diabetic renal failure. ACE inhibitors have been shown to be effective for indications other than hypertension even in patients with normal blood pressure. The use of a maximum dose of ACE inhibitors in such patients (including for prevention of diabetic nephropathy, congestive heart failure, and prophylaxis of cardiovascular events) is justified, because it improves clinical outcomes independently of the blood pressure-lowering effect of ACE inhibitors. Such therapy, of course, requires careful and gradual titration of the dose to prevent the effects of rapidly decreasing blood pressure (dizziness, fainting, etc.). The ACE inhibitor enalapril has also been shown to reduce cardiac cachexia in patients with chronic heart failure. Cachexia is a poor prognostic sign in patients with chronic heart failure. ACE inhibitors are under early investigation for the treatment of frailty and muscle wasting (sarcopenia) in elderly patients without heart failure. The main adverse effects of ACE inhibition can be understood from their pharmacological action. The other reported adverse effects are hepatotoxicity and effect on the fetus. Renal impairment is a significant potential adverse effect of all ACE inhibitors that directly follows from their mechanism of action. Patients starting on an ACE inhibitor usually have a modest reduction in glomerular filtration rate (GFR) that stabilizes after several days. However, the decrease may be significant in conditions of decreased renal perfusion, such as renal artery stenosis, heart failure, polycystic kidney disease, or volume depletion. In these patients, maintenance of GFR depends on angiotensin-II-dependent efferent vasomotor tone. Therefore, renal function should be closely monitored over the first few days after initiation of treatment with ACE inhibitor in patients with decreased renal perfusion. A moderate reduction in renal function, no greater than 30% rise in serum creatinine, that is stabilized after a week of treatment is deemed acceptable as part of the therapeutic effect, providing the residual renal function is sufficient. This is especially a problem if the patient is concomitantly taking an NSAID and a diuretic. When the three drugs are taken together, the risk of developing renal failure is significantly increased. Hyperkalemia (high concentration of potassium in the blood) is another possible complication of treatment with an ACE inhibitor due to its effect on aldosterone. 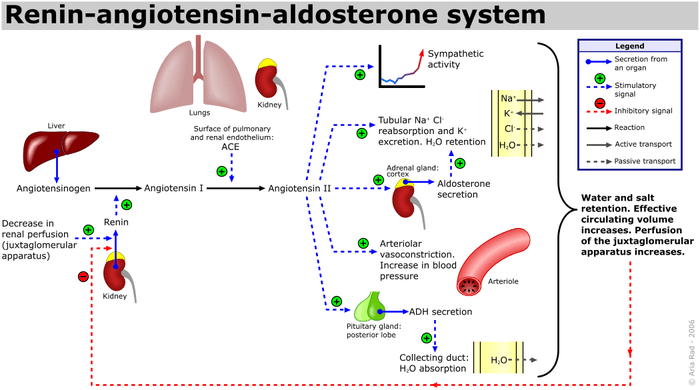 Suppression of angiotensin II leads to a decrease in aldosterone levels. Since aldosterone is responsible for increasing the excretion of potassium, ACE inhibitors can cause retention of potassium. Some people, however, can continue to lose potassium while on an ACE inhibitor. Hyperkalemia may decrease the velocity of impulse conduction in the nerves and muscles, including cardiac tissues. This leads to cardiac dysfunction and neuromuscular consequences, such as muscle weakness, paresthesia, nausea, diarrhea, and others. Close monitoring of potassium levels is required in patients receiving treatment with ACE inhibitors who are at risk of hyperkalemia. Another possible adverse effect specific for ACE inhibitors, but not for other RAAS blockers, is an increase in bradykinin level. Elevated bradykinin level due to ACE inhibition can be a cause of dry cough, angioedema and/or rash, hypotension, and inflammation-related pain. A persistent dry cough is a relatively common adverse effect believed to be associated with the increases in bradykinin levels produced by ACE inhibitors, although the role of bradykinin in producing these symptoms has been disputed. Patients who experience this cough are often switched to angiotensin II receptor antagonists. Some patients develop angioedema due to increased bradykinin levels. A genetic predisposition may exist toward this adverse effect in patients who degrade bradykinin more slowly than average. Rash and taste disturbances, infrequent with most ACE inhibitors, are more prevalent in captopril, and this is attributed to its sulfhydryl moiety. This has led to decreased use of captopril in clinical setting, although it is still used in scintigraphy of the kidney. A severe rare allergic reaction can affect the bowel wall and secondarily cause abdominal pain. Hematologic effects, such as neutropenia, agranulocytosis and other blood dyscrasias, have occurred during therapy with ACE inhibitors, especially in patients with additional risk factors (see Warnings). Patients should be advised to report symptoms such as sore throat or fever to their physician. In pregnant women, ACE inhibitors taken during all the trimesters have been reported to cause congenital malformations, stillbirths, and neonatal deaths. Commonly reported fetal abnormalities include hypotension, renal dysplasia, anuria/oliguria, oligohydramnios, intrauterine growth retardation, pulmonary hypoplasia, patent ductus arteriosus, and incomplete ossification of the skull. Overall, about half of newborns exposed to ACE inhibitors are adversely affected. Symptoms and Treatment: There are few reports of ACE inhibitor overdose in the literature. The most likely manifestations are hypotension, which may be severe, hyperkalemia, hyponatremia and renal impairment with metabolic acidosis. Treatment should be mainly symptomatic and supportive, with volume expansion using normal saline to correct hypotension and improve renal function, and gastric lavage followed by activated charcoal and a cathartic to prevent further absorption of the drug. Captopril, enalapril, lisinopril and perindopril are known to be removable by hemodialysis. ACE inhibitors are ADEC pregnancy category D, and should be avoided in women who are likely to become pregnant. In the U.S., ACE inhibitors must be labeled with a boxed warning concerning the risk of birth defects when taken during the second and third trimester. Their use in the first trimester is also associated with a risk of major congenital malformations, particularly affecting the cardiovascular and central nervous systems. A combination of ACE inhibitor with other drugs may increase effects of these drugs, but also the risk of adverse effects. The commonly reported adverse effects of drug combination with ACE are acute renal failure, hypotension, and hyperkalemia. The drugs interacting with ACE inhibitor should be prescribed with caution. Special attention should be given to combinations of ACE inhibitor with other RAAS blockers, diuretics (especially potassium-sparing diuretics), NSAIDs, anticoagulants, cyclosporine, DPP-4 inhibitors, and potassium supplements. Potassium supplementation should be used with caution and under medical supervision owing to the hyperkalemic effect of ACE inhibitors. Casokinins and lactokinins, breakdown products of casein and whey, occur naturally after ingestion of milk products, especially cultured milk. Their role in blood pressure control is uncertain. The lactotripeptides Val-Pro-Pro and Ile-Pro-Pro produced by the probiotic Lactobacillus helveticus or derived from casein have been shown to have ACE-inhibiting and antihypertensive functions. All ACE inhibitors have similar antihypertensive efficacy when equivalent doses are administered. The main differences lie with captopril, the first ACE inhibitor. Captopril has a shorter duration of action and an increased incidence of adverse effects. It is also the only ACE inhibitor capable of passing through the blood–brain barrier, although the significance of this characteristic has not been shown to have any positive clinical effects. In a large clinical study, one of the agents in the ACE inhibitor class, ramipril (Altace), demonstrated an ability to reduce the mortality rates of patients suffering from a myocardial infarction, and to slow the subsequent development of heart failure. This finding was made after it was discovered that regular use of ramipril reduced mortality rates even in test subjects not having suffered from hypertension. Some believe ramipril's additional benefits may be shared by some or all drugs in the ACE-inhibitor class. However, ramipril currently remains the only ACE inhibitor for which such effects are actually evidence-based. A meta-analysis confirmed that ACE inhibitors are effective and certainly the first-line choice in hypertension treatment. This meta-analysis was based on 20 trials and a cohort of 158,998 patients, of whom 91% were hypertensive. ACE inhibitors were used as the active treatment in seven trials (n=76,615) and angiotensin receptor blocker (ARB) in 13 trials (n=82,383). ACE inhibitors were associated with a statistically significant 10% mortality reduction: (HR 0.90; 95% CI, 0.84-0.97; P=0.004). In contrast, no significant mortality reduction was observed with ARB treatment (HR 0.99; 95% CI, 0.94-1.04; P=0.683). Analysis of mortality reduction by different ACE inhibitors showed that perindopril-based regimens are associated with a statistically significant 13% all-cause mortality reduction. Taking into account the broad spectrum of the hypertensive population, one might expect that an effective treatment with ACE inhibitors, in particular with perindopril, would result in an important gain of lives saved. The ACE inhibitors have different strengths with different starting dosages. Dosage should be adjusted according to the clinical response. ACE inhibitors possess many common characteristics with another class of cardiovascular drugs, angiotensin II receptor antagonists, which are often used when patients are intolerant of the adverse effects produced by ACE inhibitors. ACE inhibitors do not completely prevent the formation of angiotensin II, as blockage is dose-dependent, so angiotensin II receptor antagonists may be useful because they act to prevent the action of angiotensin II at the AT1 receptor, leaving AT2 receptor unblocked; the latter may have consequences needing further study. The combination therapy of angiotensin II receptor antagonists with ACE inhibitors may be superior to either agent alone. This combination may increase levels of bradykinin while blocking the generation of angiotensin II and its activity at the AT1 receptor. This 'dual blockade' may be more effective than using an ACE inhibitor alone, because angiotensin II can be generated via non-ACE-dependent pathways. Preliminary studies suggest this combination of pharmacologic agents may be advantageous in the treatment of essential hypertension, chronic heart failure, and nephropathy. However, the more recent ONTARGET study showed no benefit of combining the agents and more adverse events. While statistically significant results have been obtained for its role in treating hypertension, clinical significance may be lacking. There are warnings about the combination of ACE inhibitors with ARBs. Patients with heart failure may benefit from the combination in terms of reducing morbidity and ventricular remodeling. The most compelling evidence for the treatment of nephropathy has been found: This combination therapy partially reversed the proteinuria and also exhibited a renoprotective effect in patients afflicted with diabetic nephropathy, and pediatric IgA nephropathy. The first step in the development of ACE inhibitors was the discovery of ACE in plasma by Leonard T. Skeggs and his colleagues in 1956. Brazilian scientist Sérgio Henrique Ferreira reported a bradykinin-potentiating factor (BPF) present in the venom of Bothrops jararaca, a South American pit viper, in 1965. Ferreira then went to John Vane's laboratory as a postdoctoral fellow with his already-isolated BPF. The conversion of the inactive angiotensin I to the potent angiotensin II was thought to take place in the plasma. However, in 1967, Kevin K. F. Ng and John R. Vane showed plasma ACE is too slow to account for the conversion of angiotensin I to angiotensin II in vivo. Subsequent investigation showed rapid conversion occurs during its passage through the pulmonary circulation. Bradykinin is rapidly inactivated in the circulating blood, and it disappears completely in a single pass through the pulmonary circulation. Angiotensin I also disappears in the pulmonary circulation because of its conversion to angiotensin II. Furthermore, angiotensin II passes through the lungs without any loss. The inactivation of bradykinin and the conversion of angiotensin I to angiotensin II in the lungs was thought to be caused by the same enzyme. In 1970, Ng and Vane, using BPF provided by Ferreira, showed the conversion is inhibited during its passage through the pulmonary circulation. BPFs are members of a family of peptides whose potentiating action is linked to inhibition of bradykinin by ACE. Molecular analysis of BPF yielded a nonapeptide BPF teprotide (SQ 20,881), which showed the greatest ACE inhibition potency and hypotensive effect in vivo. Teprotide had limited clinical value as a result of its peptide nature and lack of activity when given orally. In the early 1970s, knowledge of the structure-activity relationship required for inhibition of ACE was growing. David Cushman, Miguel Ondetti and colleagues used peptide analogues to study the structure of ACE, using carboxypeptidase A as a model. Their discoveries led to the development of captopril, the first orally-active ACE inhibitor, in 1975. Captopril was approved by the United States Food and Drug Administration in 1981. The first nonsulfhydryl-containing ACE inhibitor, enalapril, was marketed two years later. At least 12 other ACE inhibitors have since been marketed. In 1991, Japanese scientists created the first milk-based ACE inhibitor, in the form of a fermented milk drink, using specific cultures to liberate the tripeptide isoleucine-proline-proline (IPP) from the dairy protein. Valine-proline-proline (VPP) is also liberated in this process—another milk tripeptide with a very similar chemical structure to IPP. Together, these peptides are now often referred to as lactotripeptides. In 1996, the first human study confirmed the blood pressure-lowering effect of IPP in fermented milk. Although twice the amount of VPP is needed to achieve the same ACE-inhibiting activity as the originally discovered IPP, VPP also is assumed to add to the total blood pressure lowering effect. Since the first lactotripeptides discovery, more than 20 human clinical trials have been conducted in many different countries. ↑ Jackson, Edwin K. (2006). "Chapter 30. Renin and Angiotensin". In Brunton, Laurence L.; Lazo, John S.; Parker, Keith. Goodman & Gilman's The Pharmacological Basis of Therapeutics (11th ed.). New York: McGraw-Hill. ISBN 0-07-142280-3. ↑ "Psychogenic polydipsia - Management - Emerging treatments". British Medical Journal. May 5, 2016. Retrieved October 28, 2016. ↑ Dundas, Brian; Harris, Melissa; Narasimhan, Meera (2007-07-03). "Psychogenic polydipsia review: Etiology, differential, and treatment". Current Psychiatry Reports. 9 (3): 236–241. doi:10.1007/s11920-007-0025-7. ISSN 1523-3812. ↑ Greendyke, R. M.; Bernhardt, A. J.; Tasbas, H. E.; Lewandowski, K. S. (1998-04-01). "Polydipsia in chronic psychiatric patients: therapeutic trials of clonidine and enalapril". Neuropsychopharmacology: Official Publication of the American College of Neuropsychopharmacology. 18 (4): 272–281. doi:10.1016/S0893-133X(97)00159-0. ISSN 0893-133X. PMID 9509495. ↑ Sebastian, C. S.; Bernardin, A. S. (1990-04-01). "Comparison of enalapril and captopril in the management of self-induced water intoxication". Biological Psychiatry. 27 (7): 787–790. ISSN 0006-3223. PMID 2183881. ↑ "Hypertension and diabetes: role of the renin-angiotensin system.". Endocrinol Metab Clin North Am. 35 (3): 469–90, vii. Sep 2006. doi:10.1016/j.ecl.2006.06.007. PMID 16959581. ↑ Ogbru O. "ACE Inhibitors (Angiotensin Converting Enzyme Inhibitors)". MedicineNet.com. MedicineNet, Inc. Archived from the original on 26 March 2010. Retrieved 2010-03-20. ↑ Hoogwerf BJ, Young JB (2000). "The HOPE study. Ramipril lowered cardiovascular risk, but vitamin E did not". Cleveland Clinic journal of medicine. 67 (4): 287–93. doi:10.3949/ccjm.67.4.287. PMID 10780101. ↑ Ajayi AA, Campbell BC, Howie CA, Reid JL (1985). "Acute and Chronic Effects of the Converting Enzyme Inhibitors Enalapril and Lisinopril on Reflex Control of Heart Rate in Normotensive Man". Journal of Hypertension. 3 (1): 47–53. doi:10.1097/00004872-198502000-00008. PMID 2987341. ↑ Adigun AQ, Asiyanbola B, Ajayi AA (2001). "Cardiac autonomic function in Blacks with congestive heart failure: vagomimetic action, alteration in sympathovagal balance, and the effect of ACE inhibition on central and peripheral vagal tone". Cell Mol Biol (Noisy le grande). 47 (6): 1063–7. PMID 11785658. ↑ Binkley PF, Haas GJ, Starling RC, Nunziata E, Hatton PA, Leier CV, Cody RJ (1 Mar 1993). "Sustained augmentation of parasympathetic tone with angiotensin-converting enzyme inhibition in patients with congestive heart failure". J Am Coll Cardiol. 21 (3): 655–61. doi:10.1016/0735-1097(93)90098-L. PMID 8436747. ↑ Adigun AQ, Ajayi AA (2001). "The effects of enalapril-digoxin-diuretic combination therapy on nutritional and anthropometric indices in chronic congestive heart failure: preliminary findings in cardiac cachexia". European Journal of Heart Failure. 3 (3): 359–63. doi:10.1016/S1388-9842(00)00146-X. PMID 11378008. ↑ Anker SD, Ponikowski P, Varney S, Chua TP, Clark AL, Webb-Peploe KM, Harrington D, Kox WJ, Poole-Wilson PA, Coats AJ (1997). "Wasting as independent risk factor for mortality in chronic heart failure". The Lancet. 349 (9058): 1050–3. doi:10.1016/S0140-6736(96)07015-8. PMID 9107242. ↑ von Haehling S, Morley JE, Anker SD (December 2010). "An overview of sarcopenia: facts and numbers on prevalence and clinical impact". J Cachex Sarcopenia Muscle. 1 (2): 129–133. doi:10.1007/s13539-010-0014-2. PMC 3060646 . PMID 21475695. 1 2 Rossi S, editor. Australian Medicines Handbook 2006. Adelaide: Australian Medicines Handbook; 2006. ISBN 0-9757919-2-3. 1 2 3 4 5 6 7 Sidorenkov G, Navis G (2014). "Safety of ACE inhibitor therapies in patients with chronic kidney disease". Expert Opinion on Drug Safety. 13 (10): 1383–1395. doi:10.1517/14740338.2014.951328. PMID 25148900. ↑ Fein A (2009). "ACE inhibitors worsen inflammatory pain". Medical Hypotheses. 72 (6): 757. doi:10.1016/j.mehy.2009.01.012. PMID 19231090. ↑ Warren, JB; Loi, RK (1995). "Captopril increases skin microvascular blood flow secondary to bradykinin, nitric oxide, and prostaglandins". FASEB Journal. 9: 411–418. ↑ Fuller, RW; Warren, JB; McCusker, M; Dollery, CT (1987). "Effect of enalapril on the skin response to bradykinin in man". Br J Clin Pharmacol: 88–90. ↑ Thomas MC (2000). "Diuretics, ACE inhibitors and NSAIDs--the triple whammy". The Medical journal of Australia. 172 (4): 184–5. PMID 10772593. ↑ Cohn JN, Kowey PR, Whelton PK, Prisant LM (2000). "New guidelines for potassium replacement in clinical practice: a contemporary review by the National Council on Potassium in Clinical Practice". The Archives of Internal Medicine. 160 (16): 2429–36. doi:10.1001/archinte.160.16.2429. PMID 10979053. ↑ Okumura H, Nishimura E, Kariya S, Ohtani M, Uchino K, Fukatsu T, Odanaka J, Takahashi T, Watanabe K, Itoh T, Hashiguchi M, Echizen H, Rikihisa T (March 2001). "Angiotensin-converting enzyme (ACE）阻害薬誘発性の咳嗽発現とACE 遺伝子型，血漿中ブラジキニン，サブスタンスP 及びACE 阻害薬濃度との関連性" [No Relation between Angiotensin-Converting Enzyme (ACE) Inhibitor-Induced Cough and ACE Gene Polymorphism, Plasma Bradykinin, Substance P and ACE Inhibitor Concentration in Japanese Patients]. Yakugaku Zasshi (in Japanese). 121 (3): 253–7. doi:10.1248/yakushi.121.253. PMID 11265121. ↑ Molinaro G, Cugno M, Perez M, Lepage Y, Gervais N, Agostoni A, Adam A (2002). "Angiotensin-converting enzyme inhibitor-associated angioedema is characterized by a slower degradation of des-arginine(9)-bradykinin". The Journal of Pharmacology and Experimental Therapeutics. 303 (1): 232–7. doi:10.1124/jpet.102.038067. PMID 12235256. ↑ Sørensen AM, Christensen S, Jonassen TE, Andersen D, Petersen JS (March 1998). "[Teratogenic effects of ACE-inhibitors and angiotensin II receptor antagonists]". Ugeskrift for Laeger (in Danish). 160 (10): 1460–4. PMID 9520613. ↑ Bullo M, Tschumi S, Bucher BS, Bianchetti MG, Simonetti GD (2012). "Pregnancy Outcome Following Exposure to Angiotensin-Converting Enzyme Inhibitors or Angiotensin Receptor Antagonists: A Systematic Review". Hypertension. 60 (2): 444–50. doi:10.1161/HYPERTENSIONAHA.112.196352. PMID 22753220. ↑ Cooper WO, Hernandez-Diaz S, Arbogast PG, Dudley JA, Dyer S, Gideon PS, Hall K, Ray WA (2006). "Major congenital malformations after first-trimester exposure to ACE inhibitors". The New England Journal of Medicine. 354 (23): 2443–51. doi:10.1056/NEJMoa055202. PMID 16760444. ↑ Bakris GL, Siomos M, Richardson D, Janssen I, Bolton WK, Hebert L, Agarwal R, Catanzaro D (November 2000). "ACE inhibition or angiotensin receptor blockade: impact on potassium in renal failure. VAL-K Study Group". Kidney International. 58 (5): 2084–92. doi:10.1111/j.1523-1755.2000.00381.x. PMID 11044229. ↑ FitzGerald RJ, Murray BA, Walsh DJ (2004). "Hypotensive peptides from milk proteins". The Journal of Nutrition. 134 (4): 980S–8S. PMID 15051858. ↑ Aihara K, Kajimoto O, Hirata H, Takahashi R, Nakamura Y (2005). "Effect of powdered fermented milk with Lactobacillus helveticus on subjects with high-normal blood pressure or mild hypertension". Journal of the American College of Nutrition. 24 (4): 257–65. doi:10.1080/07315724.2005.10719473. PMID 16093403. 1 2 Boelsma E, Kloek J (2009). "Lactotripeptides and antihypertensive effects: a critical review". The British journal of nutrition. 101 (6): 776–86. doi:10.1017/S0007114508137722. PMID 19061526. ↑ Kumar R, Chaudhary K, Sharma M, Nagpal G, Chauhan JS, Singh S, Gautam A, Raghava GP (2015). "AHTPDB: a comprehensive platform for analysis and presentation of antihypertensive peptides". Nucleic Acids Res. 43: D956–62. doi:10.1093/nar/gku1141. PMID 25392419. ↑ http://www.medscape.com/viewarticle/430926 "Debate: Do ACE Inhibitors Have Unique Properties, Beyond Their Antihypertensive Effect?" ↑ "The Acute Infarction Ramipril Efficacy (AIRE) Study Investigators". Lancet. 342 (8875): 821–8. October 1993. doi:10.1016/0140-6736(93)92693-N. PMID 8104270. ↑ Angiotensin-converting enzyme inhibitors reduce mortality in hypertension: a meta-analysis of randomized clinical trials of renin-angiotensin-aldosterone system inhibitors involving 158 998 patients. Van Vark LC, Bertrand M, Akkerhuis KM, et al. Eur Heart J. 2012 Apr 17. ↑ Common Medication Conversions (Equivalents): Ace Inhibitors. GlobalRPh.com. Accessed 2009-11-22. ↑ Treating High Blood Pressure and Heart Disease: the ACE Inhibitors. Consumer Reports Health Best Buy Drugs. June 2009. ↑ Dimopoulos NA, Salukhe TV, Coats AJ, Mayet J, Piepoli M, Francis DP (2004). "Meta-analyses of mortality and morbidity effects of an angiotensin receptor blocker in patients with chronic heart failure already receiving an ACE inhibitor (alone or with a beta-blocker)". Int J Cardiol. 92 (2): 105–111. doi:10.1016/j.ijcard.2003.10.001. PMID 14975535. 1 2 Luno J, Praga M, de Vinuesa SG (2005). "The reno-protective effect of the dual blockade of the renin angiotensin system (RAS)". Current pharmaceutical design. 11 (10): 1291–300. doi:10.2174/1381612053507413. PMID 15853685. ↑ van de Wal RM, van Veldhuisen DJ, van Gilst WH, Voors AA (2005). "Addition of an angiotensin receptor blocker to full-dose ACE-inhibition: controversial or common sense?". European Heart Journal. 26 (22): 2361–7. doi:10.1093/eurheartj/ehi454. PMID 16105846. ↑ Finnegan PM, Gleason BL (2003). "Combination ACE inhibitors and angiotensin II receptor blockers for hypertension". Annals of Pharmacotherapy. 37 (6): 886–9. doi:10.1345/aph.1C393. PMID 12773079. ↑ Krum H, Carson P, Farsang C, Maggioni AP, Glazer RD, Aknay N, Chiang YT, Cohn JN (2004). "Effect of valsartan added to background ACE inhibitor therapy in patients with heart failure: results from Val-HeFT". European Journal of Heart Failure. 6 (7): 937–45. doi:10.1016/j.ejheart.2004.09.005. PMID 15556056. ↑ Solomon SD, Skali H, Anavekar NS, Bourgoun M, Barvik S, Ghali JK, Warnica JW, Khrakovskaya M, Arnold JM, Schwartz Y, Velazquez EJ, Califf RM, McMurray JV, Pfeffer MA (2005). "Changes in Ventricular Size and Function in Patients Treated with Valsartan, Captopril, or Both After Myocardial Infarction". Circulation. 111 (25): 3411–3419. doi:10.1161/CIRCULATIONAHA.104.508093. PMID 15967846. ↑ Yang Y, Ohta K, Shimizu M, Nakai A, Kasahara Y, Yachie A, Koizumi S (Jul 2005). "Treatment with low-dose angiotensin-converting enzyme inhibitor (ACEI) plus angiotensin II receptor blocker (ARB) in pediatric patients with IgA nephropathy". Clinical nephrology. 64 (1): 35–40. doi:10.5414/CNP64035. PMID 16047643. ↑ Ferreira SH (February 1965). "A bradykinin-potentiating factor (bpf) present in the venom of bothrops jararaca". Br J Pharmacol Chemother. 24 (1): 163–9. doi:10.1111/j.1476-5381.1965.tb02091.x. PMC 1704050 . PMID 14302350. ↑ Ng KK, Vane JR (1967). "Conversion of Angiotensin I to Angiotensin II". Nature. 216 (5117): 762–6. doi:10.1038/216762a0. PMID 4294626. ↑ Ng KK, Vane JR (1968). "Fate of Angiotensin I in the Circulation". Nature. 218 (5137): 144–50. doi:10.1038/218144a0. PMID 4296306. ↑ Ng KK, Vane JR (1970). "Some Properties of Angiotensin Converting Enzyme in the Lung in vivo". Nature. 225 (5238): 1142–4. doi:10.1038/2251142b0. PMID 4313869. ↑ Hata Y, Yamamoto M, Ohni M, Nakajima K, Nakamura Y, Takano T (1996). "A placebo-controlled study of the effect of sour milk on blood pressure in hypertensive subjects". The American Journal of Clinical Nutrition. 64 (5): 767–71. PMID 8901799. ↑ Nakamura Y, Yamamoto N, Sakai K, Takano T (1995). "Antihypertensive effect of sour milk and peptides isolated from it that are inhibitors to angiotensin I-converting enzyme". Journal of Dairy Science. 78 (6): 1253–7. doi:10.3168/jds.S0022-0302(95)76745-5. PMID 7673515. Wikimedia Commons has media related to ACE inhibitors. AHTPDB a comprehensive platform for analysis and presentation of antihypertensive peptides. Nucl. Acids Res. November 11, 2014; doi:10.1093/nar/gku1141.